You’ve seen it in movies, and you even may have tried it by swirling your cup at home. The art of tea leaf reading is a cinematic fad most people are familiar with. Along with its cultural popularity, this art is also an ancient tradition dating back thousands of years. The art form was created to help its participants gain insight into otherwise unpredictable futures. Tapping into the meaning of tea leaf readings requires knowledge of a specific set of interpretive rules and methods. The guidelines and history of tea leaf reading go by the name of Tasseography. It also has been called Tasseomancy or Tassology. While this ancient art is not an exact science, its practice dates back hundreds of years. To this day, people look to this art of divination to seek guidance and answers to life’s complicated questions. The practice of Tasseography is among some of the oldest variations of divination in the world. This practice helps users to search for and to identify patterns in the tea leaves in a person’s beverage. Coffee grounds and wine sediments can be used for interpretation as well. The readings of these remains uncover the meaning expressed in the shapes and patterns in the bottom of the cup. The findings in the remains can then be used to provide insight into our everyday lives and our futures. The ideals and customs of tea leaf reading were traditionally practiced in Asia, but they also have roots that date back to Gypsies and ancient Celtics. While tea leaf readings are rooted in these customs and locations, the popularization of these readings came during the 18th and 19th centuries with shipments of tea from China to the western world. The first standardized and published guide to tea leaf readings came from England. The first edition was published during the 18th century. The book was written anonymously and made tea divination a classless practice that progressed with the normality of tea drinking culture. This divine practice peaked in the Victorian era of the 19th century. Tasseography tells people about their lives and what their futures may bring. The practice is simply the identification of shapes in the bottom of one’s cup. For example, if your coffee or tea grounds create the shape of a square, then you should expect comfort and peace in your future. Along with the shapes themselves, the placement of the shape in your cup also helps to differentiate your fortune. For example, a clover in the top of the cup is lucky while one at the bottom means you have enemies. Many symbols in your leaves or grounds also interact with one another. If your cup were to hold more than one symbol, the two would interact to indicate your future. Like many other spiritual practices, tea leaf readings are a way to give us “answers” for the unknowns in our lives. The many shapes of readings can tell us of our success or downfalls at work, in relationships, and in life in general. Animal shapes are especially confusing in their mixed meaning, so be sure to research them thoroughly if they appear. Brew the tea. Any variation of tea may be used for reading. However, do not use a strainer because you need the leaves to do your reading. Prepare Yourself Mentally. Think about your life or any unanswered question you may hold while the tea brews. If you are reading someone else’s leaves, then the contemplation would need to be done by that person with the cup sitting before them. Drink Carefully. 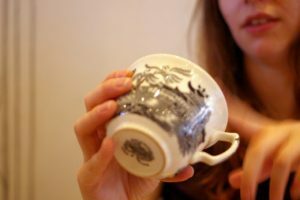 The person in the contemplative state then drinks their cup of tea but is careful to keep their tea leaves in the cup. With very little liquid remaining, swirl the cup around slowly. Once you’ve completed this task, pour out the rest of the liquid from the cup. Read the Leaves. Now, the fun part, read the tea leaves by identifying the patterns or shapes in the cup. You will need to use a scrutinizing eye to determine exactly what you see before you in the cup. While it is not an exact science, do you best to identify the most prominent pattern or shape. Now that you have completed the previous four steps, you need to identify what your shape or symbol means. Remember that patience and self interpretation are key to this process, so take your time to think these through. The essential and most basic component of tea or coffee reading is the interpretation of patterns. When reading grounds of leaves, the individual needs to use their logical reasoning from a symbol reading book or prior knowledge. Alongside logical reasoning, they must listen to their own intuition to gain the full meaning of what they see. While some symbols are clear, some patterns or markings have changed meaning through the course of history. For example, certain animals used to signify the same meaning as our modern-day plane or ship travel symbols. Both a horse and a plane may be read to indicate a journey or departure in life. Similar to our own identifications, certain symbols can be more significant to specific subjects. For example, a cow could indicate prosperity for some. For others, a cow could mean a significant gain in weight or a change in lifestyle to more rural practices. It is all about who the person is in relation to their reading. Tea leaf reading is not an exact science or even a science at all. It is about interpretation and each person’s situation in life. A person in a difficult situation may be more likely to see the negative in a reading rather than a more enlightened truth. Like people, tea leaf readings can be flawed and are always situational. Anchor – This can mean good fortune in your work life or love life. Keep in mind that if this symbol appears blurred or clouded, it will mean the opposite. Birds – These can mean good luck, or possibly good travels. Clouds – These mean significant difficulties. However, if there are dots surrounding the clouds, this means monetary wealth. Goat – You may encounter an enemy. Hourglass – This indicates upcoming danger. Lines – A line can indicate a journey, and the direction your path may take. Crooked lines mean tough travels while straight lines mean peacefulness and happiness. Sword – This can mean an argument taking place between lovers. There are many, many symbols out there, so don’t limit yourself to studying just the ones listed here. As humans, we are constantly curious about the unknown. We are always asking why, how and when. We want to understand where we are going and why we are here. When we get tired of wishing, we act. This is why divination practices come to be. Divinations are as old as humankind. 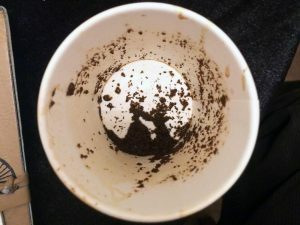 Like many other methods, Tasseography has been used for hundreds of years to gain an insightful perspective to understand something we ponder within our universe. Tasseography is an art form of divination. Unlike scientific fact, tea and coffee reading are nearly impossible to prove. With a practice open to so many biases, it is nearly impossible to have a cohesive interpretation from all who read leaves. 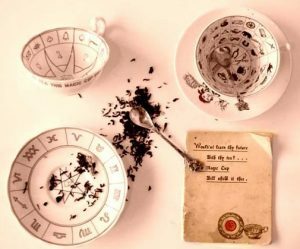 Whether you are looking for a sign to decide your future or a simple answer to a current problem, tea leaf or coffee ground reading are excellent ways to find peace of mind in the midst of life’s most complex issues. Tea leaf reading is an ancient art that can be used to make one feel connected to the past generations and help one to understand the future. While the readings may or may not come true, the hope and clarity these readings can provide may make all the difference in how you view the future. In a world where outlook is everything, a new perspective from a tea of coffee reading may just have the power to change your life.